So what does Mason Zurek do after a record-setting 278-yard rushing day to win the Monon Bell? 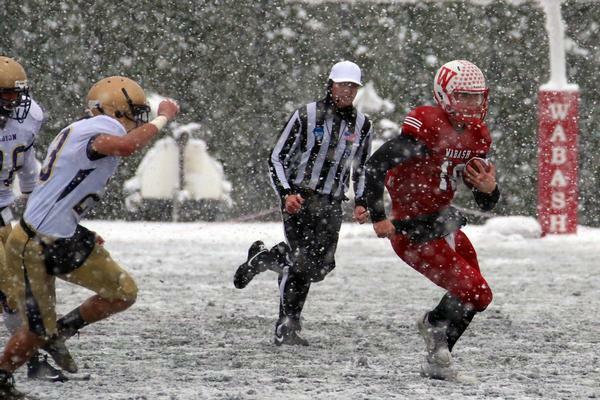 He rushes for 326 yards and four touchdowns in a come-from-behind 35-14 win over Albion in the first round of the NCAA playoffs. 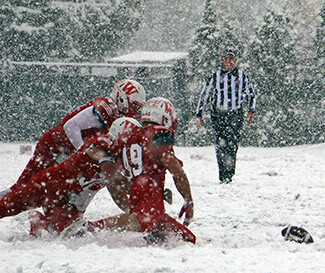 Wabash (11-0) pounded its Michigan neighbors in the second half to the tune of 29 points to just 7 for the Britons (9-2). The Little Giants advance to the second round Thanksgiving weekend and will face 11-0 Thomas More College. 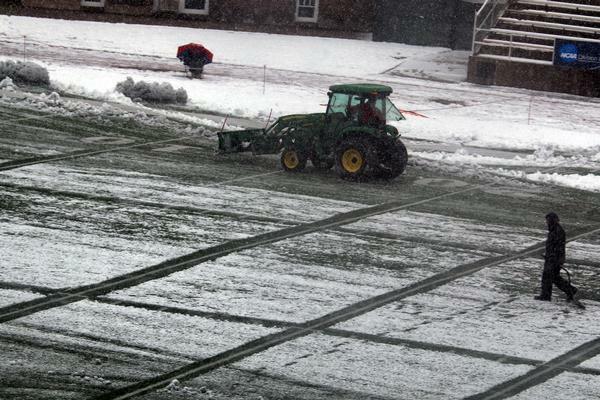 The game’s location will be announced by the NCAA Sunday morning. 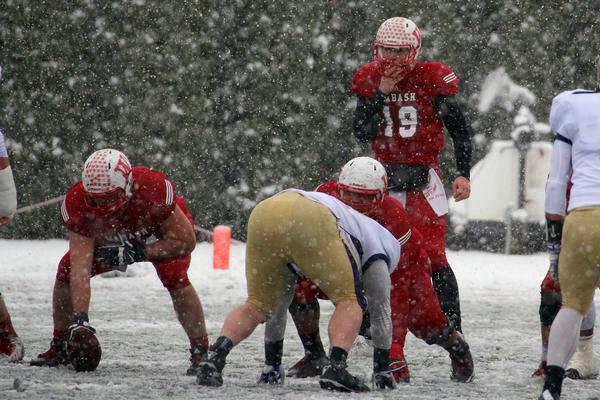 Albion entered the game as one of the nation’s top scoring offenses. The contest had been billed as strength on strength with the Brit firepower and Wabash’s stubborn defense. 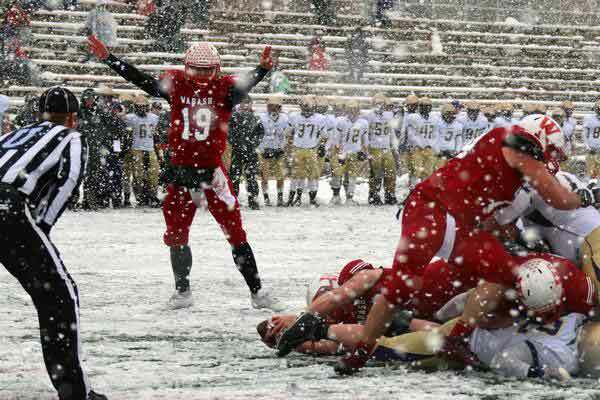 But heavy snowfall slowed both teams in the first half before Wabash opened up the offense and turned to its power running game. “We had bad starting field position in the first half,” Coach Erik Raeburn said. “So that made it tough and then with the bad weather … you have to be conservative, certainly but maybe I was a little too conservative. We played a little more aggressive in second half, spread them out and hit some pass plays. I think that was part of the difference. 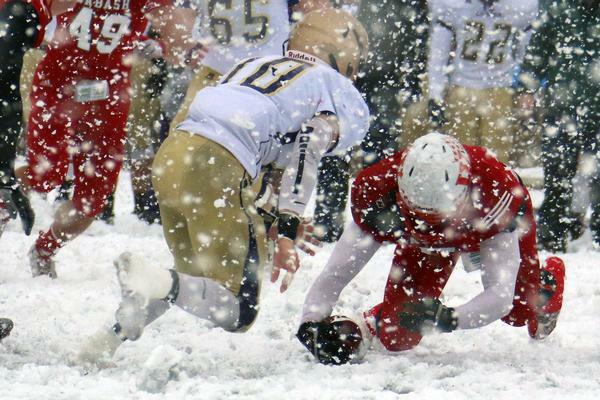 After a 45-minute half to clear the heavy snow from the field, Albion struck on a Chris McCall 57-yard catch and run from Brit QB Dominic Bona, the Michigan Athletic Association Conference Player of the year. Wabash answered emphatically in its next possession. Zurek’s first half five- and six-yard runs became double digit gainers. After a 13-yard gain, the North Coast Athletic Conference offensive player of the year ran 29 more to pull Wabash within two. 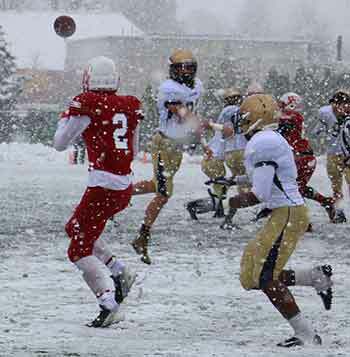 A two-point conversion from Connor Rice to Drake Christen tied the game and turned the tide. Then it was an old fashioned Zurek left, Zurek right, and Zurek up the middle. 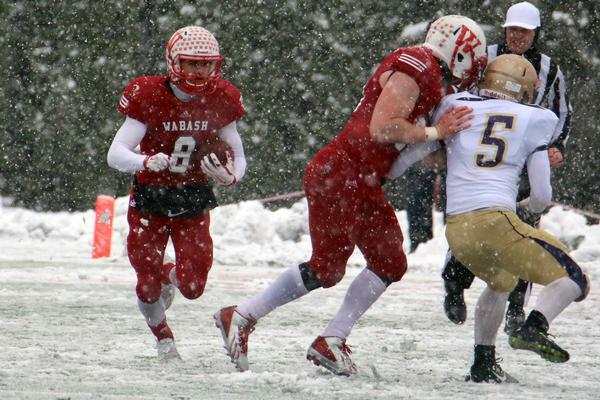 During Wabash’s second possession of the half Zurek ran the ball for 8, 35, and 5 yards before a 6-yard TD, 21-14. Austin Brown then picked off a Bona pass on a quarterback hurry by Evan Hansen. 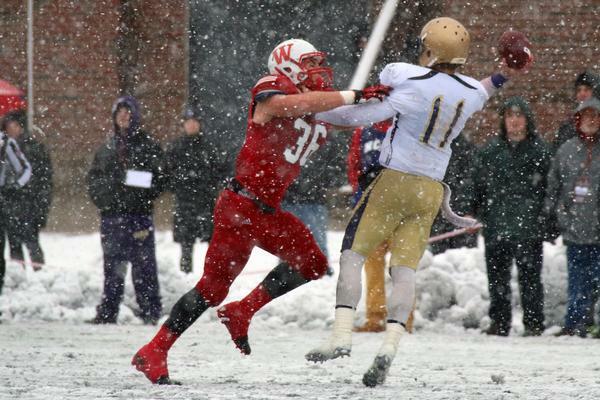 Zurek ran the ball on 7 of Wabash’s 16 plays, capping the drive with a 1-yard plunge, 28-14. All that was left was for a little icing on the cake. Delon Pettiford intercepted a Bona pass to set the Little Giants up at their own 30. Zurek took the handoff and blew through the Briton defense for a 70-yard touchdown, 35-14. Not only did Zurek set a new Wabash single-game rushing record for the second straight week but he also recorded his ninth 100-yard game in a season – another Wabash all-time mark. Neither team could generate much first quarter offense. 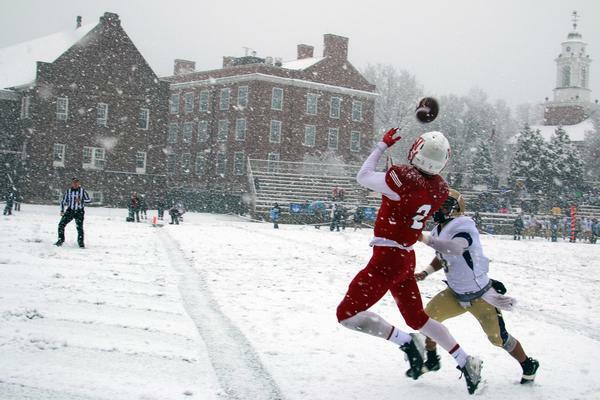 Wabash got on the board late in the first period when Oliver Page caught an over-the-shoulder 33-yard Connor Rice pass. 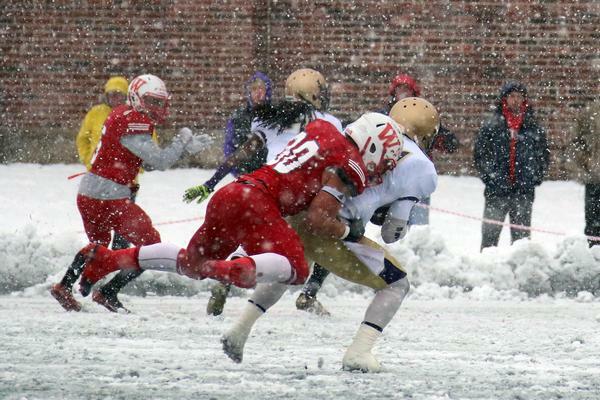 Page, who caught two TDs a week ago in the Bell game, is a bit more used to the weather. 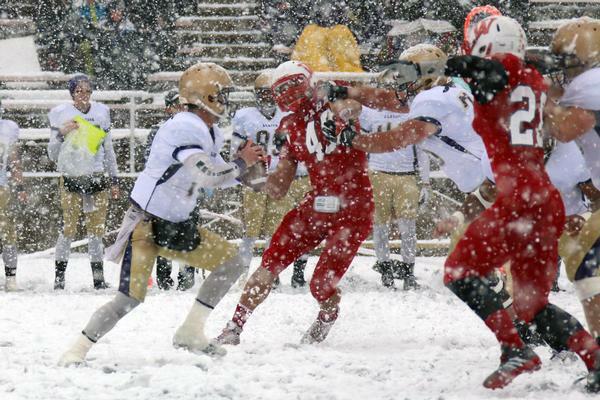 “We get snow like that sometimes up in South Bend (St. Joseph HS) with the lake effect so I’m kind of used to it. It was a challenge keeping the gloves dry but it’s the same for both sides. 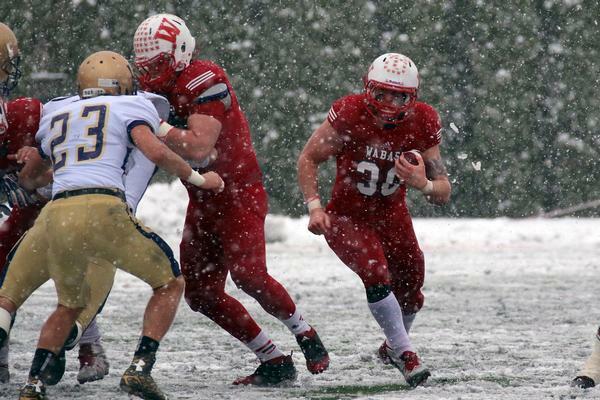 Zurek’s incredible 326-yard day pushed Wabash to a 432-292 rushing advantage. Freshman Matt Penloa added 69 yards on 11 touches. Rice was 8-20 for 90 yards and a TD. Page and Christen paced the LGs with 3 catches each. Defensively, Evan Hansen recorded 13 tackles, Ludwig 8 with two sacks, Ethan Buresh 7 with a sack, and Evan Rutter notched 7. 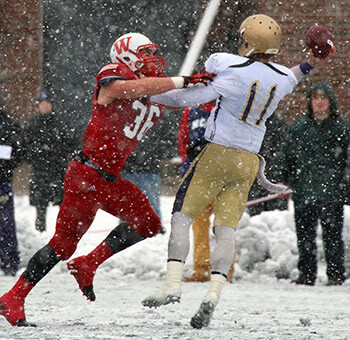 The Brits' Bona hit on 12 of 22 passes but threw three interceptions. He was sacked three times as well. Albion arrived averaging a little more than 50 points a game this season. 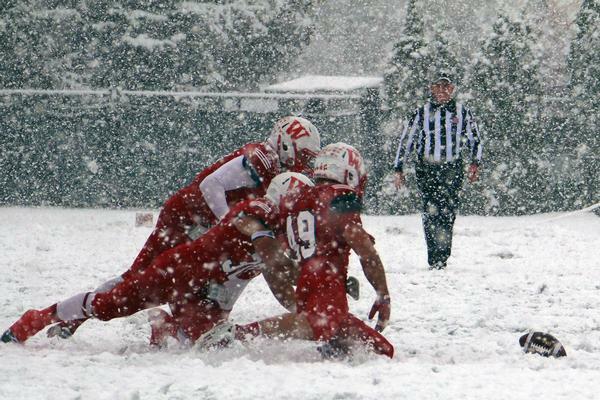 Wabash has not allowed any team to score more than 18 this fall.